Sony confirmed the arrival of the PS Vita Slim in the UK at today's press conference. Previously available only in Japan, the PS Vita 2000 model, often dubbed the PS Vita Slim, will launch in the UK on Feb. 7th for Â£180, a Sony press conference confirmed this morning. UK retailer ShopTo leaked the information yesterday in an email to customers, alerting people of the slim model opening to preorders today. The press event was announced a week ago as Sony sent out invites to members of the press for the PlayStation's "slimmest" launch. Sony has not announced a release date for North America yet. Sony also announced the Indie Game Mega Pack. Games included are Alien Breed, Thomas Was Alone, Velocity Ultra, Men's Room Mayhem, Coconut Dodge Revitalized, Limbo, Hotline Miami, Total Recoil, Superfrog HD, and Floating Cloud God Saves the Pilgrims. A bundle including the Vita handheld and the game pack will cost €199.99. The Indie Game Mega Pack with a 4 GB memory card and a PlayStation Store voucher to download the 10 games is priced at €24.99. The pack will release in February. The changes from the original Vita model to the slimmer model are largely cosmetic. The PCH-2000 is lighter, thinner, has edges that are more curved, and a LCD screen replaces the OLED screen. The battery life is said to offer another hour to last to six hours, and the 2000 model also has a built-in 1 GB memory card. 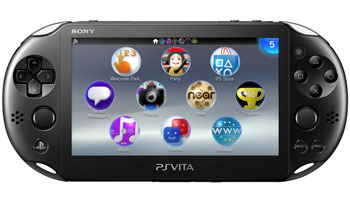 The slim Vita was available in many colors in Japan, but it will be available only in black in the UK. Sony also intends to faze out the first Vita model in the UK and will not replenish its stock as the slim model will replace it.